For the district of the old unicameral Victorian Legislative Council 1851–1856, see Electoral district of Villiers and Heytesbury (Victorian Legislative Council). Villiers and Heytesbury was an electoral district of the Legislative Assembly in the Australian state of Victoria from 1856 to 1904. It was based in western Victoria, and included the area from Lake Corangamite along the coast westward past Port Fairy. 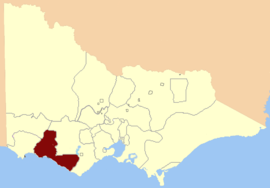 The district of Villiers and Heytesbury was one of the initial districts of the first Victorian Legislative Assembly, 1856. Two members initially, one after the electoral redistribution of 1889. "Villiers and Heytesbury Election — Petition of R. D. Ireland Esq., Against the Return of William Rutledge Esq" (PDF). Parliament of Victoria. 14 May 1861. ^ "Electoral Districts of South Grant, North Grant, North Grenville, Ripon, Hampden, South Grenville and Polworth, Villiers and Heytesbury, Normanby, Dundas and Follett" (map). 1856. Retrieved 10 May 2013. ^ Edward Sweetman (1920). Constitutional Development of Victoria, 1851-6. Whitcombe & Tombs Limited. p. 183. Retrieved 4 April 2013. ^ "Local". Kilmore Free Press. 14 July 1870. p. 2. "Re-Member (Former Members)". State Government of Victoria. Retrieved 4 April 2013. This page was last edited on 12 May 2018, at 14:28 (UTC).